But these cracks reveal an opportunity - a chance to reimagine our leadership and shift its priorities. The world needs effective leaders with high moral integrity and a commitment to action. The World Economic Forum established the Forum of Young Global Leaders to foster leaders in public-private cooperation and forge a new model of global governance for the Fourth Industrial Revolution. 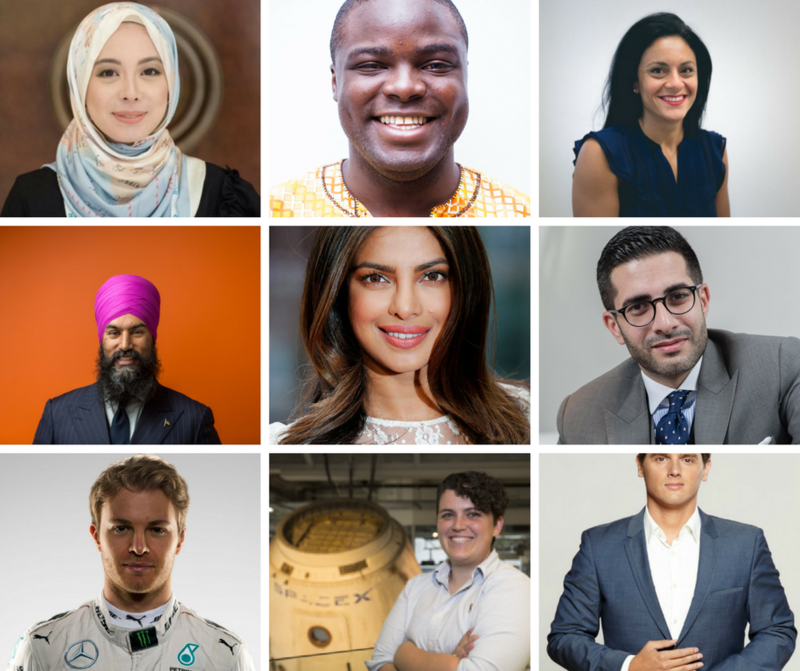 Every year, the Forum honours 100 outstanding and uniquely accomplished individuals who are committed to building a peaceful and prosperous shared global future. In return for the honour, the Forum enlists these diverse technologists, teachers, entrepreneurs and innovators in a process of discovery, to achieve more collectively than they could on their own. Through a five-year journey underpinned by principles of generosity, respect, authenticity and impact, this select group is exposed to opportunities that build their expertise and extend their influence. The journey focuses on cultivating public leadership skills and scaling impact. In fact, more than 80% of Young Global Leaders say that their interest in public service stems from a desire to improve or transform society, according to a recent survey. More than half cited the opportunity to serve as a driving force. Image: Vivy Yusof, Iyinoluwa Aboyeji, Heba Aly, Jagmeet Singh, Priyanka Chopra, Faisal Abbas, Nico Rosberg, Joy Dunn and Albert Rivera Díaz. In the public sector, we have identified pioneering leaders from around the world. From Leo Varadkar, the youngest and first openly gay Prime Minister of Ireland to Kaila Murnain, the youngest and first female General Secretary of Australia’s New South Wales party, these leaders are ushering in fresh political ideas and promoting dynamic societies. Government administrator Armstrong Pame, nicknamed the "miracle man", brought 100km of roads to his Indian district in order to spur economic growth. This new generation of political leaders will not be deterred by political paralysis. Our business leaders represent the world’s largest corporations, as well as start-ups. They take nothing for granted and pursue big ambitions. In the tourism sector, Valeri Chekheria’s boutique hotel company aims to revolutionize Georgia (currently aspiring to join the EU) through its hospitality industry. Gloria Fluxa Thienemann wants to recast Grupo Iberostar’s model of sustainable tourism, to preserve marine life and oceans particularly. In the technology space, Mustafa Suleyman, who aged 19 helped set up one of the largest telephone counselling services for mental health in the UK, now oversees integrating AI technology across a range of Google products. Rhea Mazumdar Singhal is tackling the issue of plastic waste in India, where 25,000 tons is produced daily. She brings affordable biodegradable alternatives to plastic to the food packaging industry. Fern Shaw, a renaissance woman at UPS, supervises 15,000 employees in finance, sales, package and transportation operations, industrial and plant engineering, human resources, automotive, security, and labour relations. She also sponsors UPS’ Women’s Leadership Development and LGBTQA Business Resource Groups. Our Young Global Leaders confound traditional sectoral divisions and confront the status quo. They are social innovators, creative ambassadors and agents of the under-represented. Michael Faye, the Director of Give Directly, is challenging historical international aid models. Iyinoluwa Aboyejio co-founded a digital payments platform that is addressing the issue of money transfer across Africa, empowering pan-African merchants to execute business on global scale. Heba Aly advances issues of human rights, humanitarian crises and international development on the global agenda through one of the world’s leading humanitarian news sources. Meanwhile, some of our notable nominees in creative industries include Hao Jingfang, the first Chinese woman to win the Hugo Award for science fiction, and Alejandro Malgor, whose company has recycled more than 13 tons of rubber tyres into 20,000 pairs of shoes. These enterprising young leaders stir our ambitions for the future. We are proud to invest in their continued and significant successes. In return for our investment, it is our aim that they galvanize unity and inspire integrity within our fractured global landscape.